Perhaps made as a bridal quilt, this lovely appliqué is an exquisite example of mid-nineteenth-century quilting and appliqué motifs. 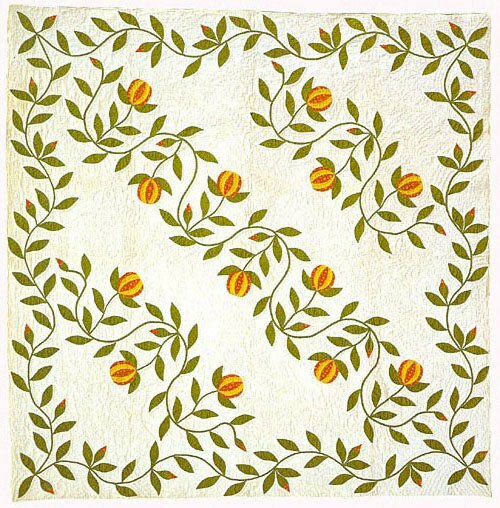 Although trailing vines and pomegranates were often used during this time period, constructing the quilt on the bias and in such a bold manner makes it a rarity. The quilting designs are nothing short of spectacular! They have been copied directly from the quilt and are included as stencils in the pattern, as are stencils for marking the appliqués. Hand and machine instructions are also given for this 85" x 87" quilt.